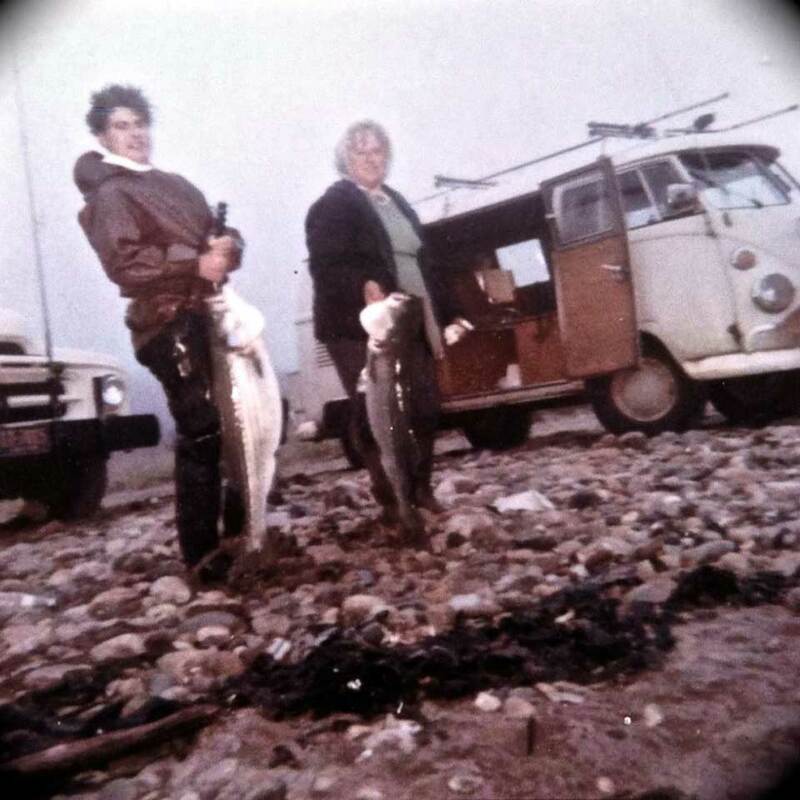 Bruce Fradl, 15 yrs, with his mom Nancy and their 1963 Volkswagen bus at Jones Reef in the fog with the 24 lb. and 26 lb. bass he caught. In the summer of 1963, I was 22 years old and it was my first summer fishing Montauk. Not knowing anybody, I just happened to go down to somewhere around Evan’s Rock and just walked in the water. There were eight or ten guys in a picket line fishing and I got on the end, the down tide side of the picket line, on the outgoing tide. We were catching pretty large bluefish, anywhere from 12 to 15 lbs., and I had a few fish on my stringer. In those days I used a chain stringer and an army pistol belt. I was on the right side, facing the water and there about 8 to 10 people up tide of me. As I’m fishing, I keep hearing a voice coming from the left side of me asking for help. It turns out to be a young kid, about 13 years old, he had a fish on and it was literally pulling him out. No one was helping him, so when he got to me, I was the last guy on the line and the next stop was England! So as he got to me, I grabbed ahold of him and helped him out. He was still fighting the fish and I just held onto him. When he got the fish in, we were sorta tangled up with stringers and rods and reels and a big wave came – one of the larger rollers – and it dumped us a little bit. The fish, which was still on his yellow darter, landed on my leg. It put a hook through my waders and bit a hole in my waders at the same time. I filled up with water and that 15 lb. fish almost ended up drowning the both of us. I dragged Bruce, his stringer with a few fish, my stringer with a few fish and his rods and reels and plug bags and we managed to get back to the beach. He told me his name was Bruce Fradl and he was 13 years old. His parents, Gary and Nancy, were there with their old Volkswagen bus. They thanked me and his father patched up my waders, gave me a cup of coffee and back in the water we went. This was 50 years ago. Bruce was 13 and I was 22, and even though he was younger than me, we became good friends. We all fished together and as his dad got older, Bruce and I would go out. I ended up being very good friends with his father Gary, who was an excellent fisherman and a real gentleman. His mom, Nancy, would walk the beach collecting plugs after a storm. We’d fish together, eat together and had lots of laughs. I became part of their extended fishing family and Bruce and I are still great friends. Bruce has been fishing his whole life. He’s an excellent hunter, a fabulous fisherman and an great friend. He also makes the best bucktails on the planet. They’re designed to fish Montauk because they have a lot of hair and you can find them at his site, Montauk Saltwater Tackle. This fall, we’re hoping to have a reunion with some real old time Montauk regulars. We’ll fish, and laugh and have a big ol’ Montauk breakfast. Just like the old days. Chief Rockhopper, Barry & Bruce Fradl. Together, they’ve caught (and eaten) countless fish.